​​A necessary and exciting addition to both the Sri Lankan-American and LGBTQ canons, SJ Sindu's debut novel Marriage of a Thousand Lies offers a moving and sharply rendered​ exploration of friendship, family, love, and loss. Lucky and her husband, Krishna, are gay. They present an illusion of marital bliss to their conservative Sri Lankan–American families, while each dates on the side. It’s not ideal, but for Lucky, it seems to be working. She goes out dancing, she drinks a bit, she makes ends meet by doing digital art on commission. But when Lucky’s grandmother has a nasty fall, Lucky returns to her childhood home and unexpectedly reconnects with her former best friend and first lover, Nisha, who is preparing for her own arranged wedding with a man she’s never met. As the connection between the two women is rekindled, Lucky tries to save Nisha from entering a marriage based on a lie. But does Nisha really want to be saved? And after a decade’s worth of lying, can Lucky break free of her own circumstances and build a new life? Is she willing to walk away from all that she values about her parents and community to live in a new truth? As Lucky—an outsider no matter what choices she makes—is pushed to the breaking point, Marriage of a Thousand Lies offers a vivid exploration of a life lived at a complex intersection of race, sexuality, and nationality. The result is a profoundly American debut novel shot through with humor and loss, a story of love, family, and the truths that define us all. SJ Sindu is the author of the novel Marriage of a Thousand Lies and the hybrid fiction and nonfiction chapbook I Once Met You But You Were Dead. She holds an MA in English from the University of Nebraska-Lincoln and a PhD in Creative Writing from Florida State University. Sindu lives in Tampa and teaches at Ringling College of Art & Design. "A remarkable novel rich with interlocking issues both timeless and timely. SJ Sindu’s debut is more than impressive; it’s important." "SJ Sindu has written an important novel about Sri Lankan immigrant culture. Here, the intersections of migration, sexuality and culture are explored in loving and heartbreaking detail. A book that reveals the secrets of a community caught between East and West." "[A] perceptive, subtle, and provocative first novel. Sindu’s characters are all believably complicated and compassionately observed, and she anchors the central tension between individuality and ties to family in concrete scenes from Lucky’s life. The author’s quirky sense of humor and matter-of-fact take on a potentially fraught situation keep the tone of the novel deceptively light, resulting in a moving and memorable story." "Enthralling . . . Sindu is a skilled writer, and this is a remarkable first novel." "Sindu handles the complexities of identity beautifully." 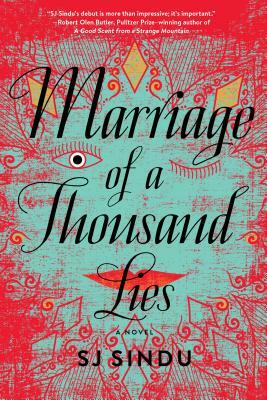 "Marriage of a Thousand Lies is a rare book, written from a queer, South Asian perspective, but a welcome addition to an all-too-small canon.​"
"​[Sindu] ​has written a debut novel that is honest and moving—a complex story about a Sri-Lankan family and a strong female protagonist who struggles with her own identity against a backdrop of deep traditions and community." "Sindu’s heart-wrenching debut novel . . . incorporates love, loss, family, rebirth and growth to tell a captivating story you won’t be able to put down." ​"S​indu takes on the conflict between love of family and of oneself with clarity and laughs." ​​"Marriage of a Thousand Lies is a beautiful exploration of queer South Asian-American identity​. With both a compelling plot and a beautifully crafted cast of characters, this novel is a must-read.​"
​"So good . . . heartbreaking in the way it portrayed the characters torn between happiness and custom. ​SJ ​Sindu does a beautiful job describing how Lucky feels about living a secret life and her fear of disappointing her parents, and the language and imagery is gorgeous." "SJ Sindu’s fine debut [is] a timely tale with themes of immigration, free will, identity, and personal choice." "A​n important intervention in the canons of both LGBTQ and South Asian literature. Marriage of a Thousand Lies is not only important: it’s also a beautiful book, with fresh, tidy prose, and complex, flawed characters, a novel that is at once sad and hopeful.​"
​​"Marriage of a Thousand Lies is a deeply affecting work in many ways.​"
"​A​ poignant, heart-warming love story."